Royalty: Ukrainian soprano Svetlana Nikitenko ruled the stage as the Queen of the Night. THERE'S A NEW THEORY about the early death of Mozart. The great operatic dramatists Verdi and Puccini apparently passed through a time portal and witnessed the premiere of The Magic Flute. Afterward, they felt obligated to visit Mozart backstage and finish him off then and there. The Magic Flute is such a theatrical mess because Mozart and his librettist, Schikaneder, decided they had 57 things to say, and by damn, they were going to say them all, attempting to string everything together on some sort of spiritual Freemason journey. The result is tolerable, regardless, because it's the work of a genius at the peak of his powers, full of musical gems and even some interesting ideas, if you can find them. Fortunately, Opera San José and its stage director, Michael McConnell, have made all the right decisions for the company's current production. For one thing, they treated the opera's Singspiel form in German for the songs (preserving the intended sound) and English for the spoken dialogue (ensuring that we get the jokes). McConnell also translated the supertitles himself--opening the way for some much-needed irreverence. When the bird-catcher Papageno sits down for a snack as Prince Tamino plays the enchanted flute, he comments, "Ah, dining with the classics!" Later, as he counts off the seconds until his suicide attempt, he shouts, "Two!" as the supertitle screen flashes the German "Zwei!" Another great help is the costume and makeup work of, respectively, Connie Strayer and Sara Beukers. If you get lost, you can always go by skin color (the ladies are literally blue in the face, while the bad guy, Monostatos, is a monstrous green), and there are some luscious outfits, beginning with the purple-velvet gown of the Queen of the Night. 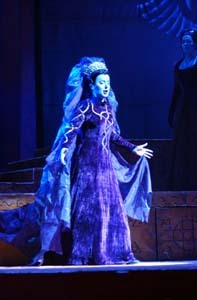 Musically, we're all there to hear the Queen of the Night aria ("Der Holle Rache"), anyway, and Ukrainian soprano Svetlana Nikitenko didn't let us down on Saturday (the main roles are double cast). Interestingly, though everyone is drawn to the top-range staccatos of that aria, the earlier, more legato runs of the queen's entrance are much more demanding. Tamino, the hero, was played by tenor Jonathan Hodel, who continued to have those first-inning blues, pinching his top range until he warmed up halfway through the first act. Pamina, soprano Sandra Rubalcava, had an athletic analogy as well, looking much leaner physically while sounding much stronger. Already possessed of a natural stage presence, she needs perhaps 10 percent more care in her phrasing to be the perfect triple-threat prima donna. As Papageno, baritone Jason Detwiler was half Scarecrow, half Niles Crane, and entirely charming. You also being to realize that his character could be the closest to Mozart himself: a kind of court jester for the queen, stuck forever between his lust and his music. Despite everything, I leave each performance of The Magic Flute with one new thought. This time it is: Pamina has a fascinating family. Her mother, the Queen of the Night, is like a really vindictive divorcee. But despite the queen's villainy (e.g., asking her daughter to knife her late husband's pal, Sarastro), she is, after all, the one who gives Tamino and Papageno the magic flute and glockenspiel--the instruments of their eventual enlightenment. And what's more: the flute was fashioned by Pamina's late father. Had Mozart and Schikaneder concentrated on that, and not all this Freemason pap, they might have had themselves an opera.